We use moment methods to construct a converging hierarchy of optimization problems to lower bound the ground state energy of interacting particle systems. We approximate the infinite dimensional optimization problems in this hierarchy by block diagonal semidefinite programs. For this we develop the necessary harmonic analysis for spaces consisting of subsets of another space, and we develop symmetric sum-of-squares techniques. We compute the second step of our hierarchy for Riesz $s$-energy problems with five particles on the $2$-dimensional unit sphere, where the $s=1$ case known as the Thomson problem. This yields new sharp bounds (up to high precision) and suggests the second step of our hierarchy may be sharp throughout a phase transition and may be universally sharp for $5$-particles on $S^2$. This is the first time a $4$-point bound has been computed for a continuous problem. de Laat, D. (2016). 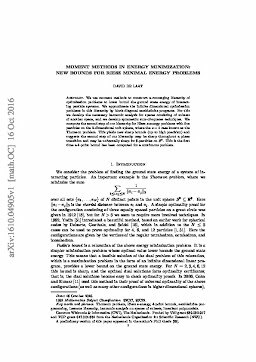 Moment methods in energy minimization: New bounds for Riesz minimal energy problems.